IN CONJUNCTION WITH THE 15th BEST OF PLAYGROUND FESTIVAL, which is playing May 5-29 at the Thick House in San Francisco, we will be interviewing the Festival playwrights so you can get to know them a little better. Our first playwright—Arisa White—is not only new to the Festival, but new to PlayGround as well. Actually, she is new to playwriting in general. Arisa is not new to writing, however; she received an MFA in poetry at the University of Massachusetts, Amherst in 2006. Author of two poetry chapbooks, Disposition for Shininess (Factory Hollow Press, 2008) and Post Pardon (Mouthfeel Press, 2011), she was selected by the San Francisco Guardian for the 2010 Hot Pink List. She has received residencies, fellowships, and/or scholarships from Squaw Valley Community of Writers, Atlantic Center for the Arts, and University of Western Michigan, among others. Nominated for a Pushcart Prize in 2005, her poetry has appeared in numerous publications and is featured on WORD with the Jessica Jones Quartet and in the staged production of Fingernails Across A Chalkboard: Poetry and Prose on HIV/AIDS from the Black Diaspora. She wrote her play Frigidare for the first Monday Night PlayGround of the season back in October. The topic of the month was “It Gets Better,” the title of a video project launched by journalist Dan Savage, who wanted to encourage gay youth struggling with bullying, in reaction to a spate of teen suicides. 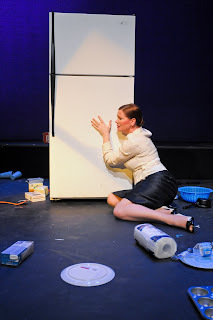 Frigidare is one of seven plays in the Festival. Jon Tracy directs, and Michael Phillis and Holli Hornlien perform. Are you from the Bay Area originally? No, I am originally from Brooklyn, NY. Moved our here five years ago after finishing an MFA in poetry. A close poet friend of mine suggested after I get my degree to go to a place I have always wanted to live and write. A new context does wonders for writing--leads you in different directions as well. Where in the Bay Area do you currently live? What do you do, besides write plays? I am a full-time editorial assistant at a dance education magazine, Dance Studio Life. I volunteer as a blog editor for Her Kind, a project of VIDA: Women in Literary Arts, that brings women writers in conversation with one another on topics that are related to the industry and to their lives. And I write poems. I have been awarded the inaugural Rose O’Neill Literary House-Cave Canem Summer Residency at Washington College. The residency gives one Cave Canem fellow the opportunity to spend the month of July at Washington College in Chestertown, Maryland, working on a new poetry manuscript. I will be completing a collection of persona poems based on a woman who was held captive in her home for 12 years. As a part of this residency, I will teach a full day poetry workshop to high school students, which I am looking forward to doing. I enjoy teaching and sharing what I love to do with young people. Why do you think your play was chosen to be in the Festival? I think my play was chosen because of its dry humor and ability to make others think about how our generalizations, assumptions, and stereotypes govern most of actions. What inspired you to write Frigidare? Frigidare was definitely inspired by the October topic of "It Gets Better." I was thinking about socialization and how culturally and socially we conspire to make people be a certain way, and when they do not fit what is deemed heteronormative, there is violence taken out on that individual. And the violence does not need to be extreme and ghastly, it can be passive actions that result in isolating an individual because they do not adhere to the value system of mainstream culture. And in thinking about this, I wondered, what if a mother was determined to make her child be and experience the things we considered bad, wrong, inappropriate, etc, in the hopes of making them a better person? What was the writing process like for it? Like most things I write, I take a significant amount of time to let it bloom in it--take shape emotionally and then I wait for the image, the words, or the character to come to be. Once that happens, I go with it until there is nothing left to go with. There were moments when I thought, is this too ridiculous? A boy in a refrigerator? Would a mother do something like this? I had to let the doubt fuel the creation of the piece, because if I was questioning it, that meant it had to be, I had to try this, I had to make it plausible. Frigidare felt risky to me and when I feel that with any of my writing, I know this is where I need to go, explore, and investigate. Writing is a process where I better understand my human nature and the nature of others. What do you hope people will take away from seeing Frigidare? That we can't make others be what we want them to be; we can't force our agendas, beliefs, or values on others even when we think it's coming from a place of love. We have to provide the space for others and ourselves to be without judgment. Did you write plays before PlayGround? When I was a freshman in high school I took a playwriting class with Young Playwrights, Inc. in New York City. Then, I wrote a full-length play about a teenager who finds out she is pregnant and is figuring out what to do. Later, as an undergrad at Sarah Lawrence, I audited a class on writing the monologue but only showed up for the first class--by that time, I was very much into poetry and focused my energy there. How did you come to start playwriting? Growing up with many siblings--I am the oldest daughter of seven--we would entertain ourselves with making skits and recording them on our camcorder. My older brother, younger brother and sister and I would spend our weekends together in imaginary land, being superheros who saved people from other planets, attacked Martians, and then we would do commercials for Minute Maid Fruit Punch! What are your goals as a playwright? Admittedly, I am still forming those goals. I'm still getting my feet wet and learning to better understand the form and what I can do in it. Goals that I have for myself as a person, being in this culture and society, is to find the beauty where you least expect it. To take difficult realities and show the people involved and how their experiences have shaped them. To take risks artistically, emotionally, and personally so that I can further evolve myself and the work I love to do. How does your process for writing poetry compare to your process for writing plays? The process is different and the same, I would say. Working in the play form, I have to make my characters embody and show the emotion, I have to move them around. I have to think about a body in space, which is a whole other level awareness that I need to bring to the page when writing. With poetry, the poem doesn't need the body in the same way. It is far more of an introspective process--I can solely deal in the realm of immaterial: spiritual or emotional without having to think about how each word, image, will move the poem forward. Essentially, I get to abandon causality, if I choose. And that is where I wrestle a bit with playwriting: can I have a character do or say something without needing to move the moment forward or backward? Is there always cause and effect? Because I have spent more years with poetry, I don't feel limited by the idea of what a poem should be. With playwriting, I am still grappling with what a play is and what a play is to me. Which playwrights inspire you as a playwright? Lately, I have been inspired by poet playwrights--writers who have crossed over or mixed genres. Ntozake Shange, Cornelius Eady, Muriel Rukeyser, and Claudia Rankine. Love the poetry of a person putting himself in cold storage in response to a mother's extreme attempts to make him into a better person. Arisa, I can't wait to see where your explorations of a body in space take you (and the body).